Then the AFM80S to seal envelopes even faster! And now, to go seal even faster,, How much faster!? How does up to 300 envelopes per minute sound!? Don’t worry you don’t need to go that fast, you can dial it down. All steel and weighing in at over 55 Lbs. Easy to replace and affordable parts! Best of all the AFM300S and the AFM300SE can handle just about any envelope flap! Even square invitation flaps. You’ve probably seen a similar machine selling for $7,000 to $8,000 dollars! Eliminate bottlenecks and extra wear and tear on mailroom equipment used just for sealing. Or, if you are currently sealing envelopes manually, now you can avoid this messy, time-consuming task. With the AFM300S High Speed Envelope Sealer, you just load the envelopes and go! FAST! 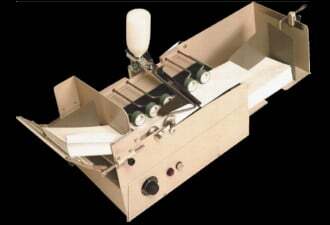 The AFM300S Envelope Sealer handles just about all envelope sizes and flaps, nested and unnested. If you want to be 100% positive it will work for your application, send us some samples! We will send you a video of it working. It also automatically adjusts to handle envelopes of different thicknesses for higher productivity. It’so quiet and easy to use, it requires no special tools or training so anyone in the office can use it. Watch the AFM300S below then click here for more information or call a sales representative before this introductory offer expires! The video below is the AFM300SE Envelope Sealer running nested envelopes in slow motion.